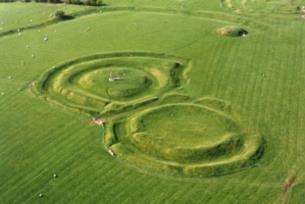 The Hill of Tara is an archaeological site situated between Navan and Dunshaughlin in County Meath. Containing a number of ancient monuments, it was the seat of the High King of Ireland and the most important centre of political and religious power. The Hill of Tara was at the height of its power as a political and religious centre in the early centuries after Christ. Held sacred by people from the Neolithic era, Tara was believed by worshippers to be a dwelling place of the gods and an entrance to the world of eternal joy. Legend has it that on his mission to Ireland, Saint Patrick first travelled to Tara in order to confront the ancient religion at its most powerful site. The earliest written records in existence show that high kings were inaugurated there; the "Seanchas Mór" legal text specified that the king must drink ale and symbolically marry the goddess Maeve (Medb) in order to qualify for high kingship. Modern day facilities at the visitor centre include an audio visual show, while guided tours of the Hill of Tara are available on request. Exciting new research and excavations by the Hill of Tara Discovery Programme research team continue to add to our understanding of the site. Access to the Hill of Tara is open all year around.